Experience a kaleidoscope of game reserves set in many different landscapes that show off Kenya at its finest. 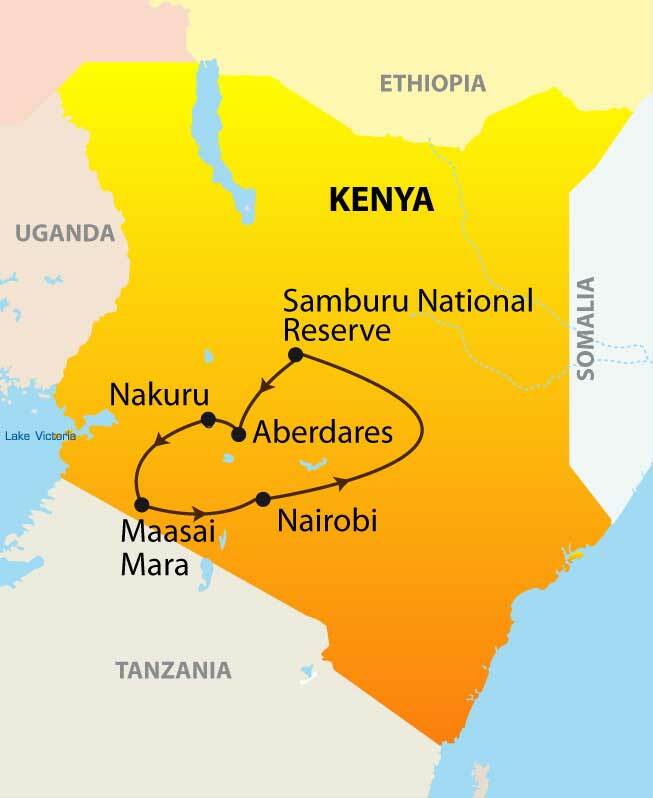 Travelling both north and south of the Equator, compare the dry domain of Samburu with its more uncommon wildlife to the expansive vistas of Maasai Mara’s plains with its great herds of game. Plus enjoy game viewing all night at one of the famous tree-hotels and try counting the uncountable flocks of pink flamingos of Lake Nakuru on this safari to remember. Upon arrival at Jomo Kenyatta International Airport you will be met by our friendly representative who will be of any assistance. Our representative provides itinerary briefing. From the airport transfer to your city hotel. Overnight at Hotel Boulevard Nairobi on bed and breakfast basis. After breakfast drive to Samburu Game Reserve to arrive in time for lunch. An afternoon explanatory drive will introduce the visitor to the numerous game animals which sustain the smaller grass-eating animals like antelope. On either side of the Uaso Nyiro River is found thick forest, with doum palm growing a little away from the banks of the river and around swamps. The fruit of the doum palms if a favorite with elephants. The source basin of the river is Buffalo springs, outside the park. The animals in this part north of the Equator are a little different from their relatives in the south. This is home to the Grevy’s zebra with finer stripes, the reticulated giraffe and the Somali Ostrich. Here one also finds the long necked gerenuk of the antelope family. The animals feed on the lower leaves of the acacia tree while the giraffe feeds on the upper leaves. One of the larger antelopes is the long horned beisa oryx. The large animals are the elephant, black rhino, buffalo and the cats, lion and leopard. Return to your game lodge in the evening. Overnight at Samburu Sopa Lodge. On this day you have early morning and afternoon game drive in this harshly beautiful terrain where wildlife abound especially near the river which is their only source of drinking water. The Uaso Nyiro River flows gently through the dry landscape sustaining life in this harsh land. Lunch and dinner at the lodge. Overnight at Samburu Sopa Lodge. After breakfast at your lodge, you will make the short trip to Aberdares National Park to arrive at Aberdares Country Club the base Hotel in time for Lunch. After lunch you will be transferred to the Ark. Visitors to procession of animals make their way to the water hole and saltlick which are floodlit later in the evening. Tea, coffee and bitings are constantly provided by the attentive staff. As the weather gets colder wood fires are lit, which makes the lodge warm enough to watch the activities of the animals at night. Dinner is served in a rustic dining room. Overnight at The Ark. You are also required to pack an overnight bag when you transfer to the Ark for the night. After breakfast at your lodge, depart driving on the floor of the rift valley past the dormant Mt. Longonot on the floor of the rift valley and further on past the Masai town of Narok to arrive at Mara in time for Lunch. 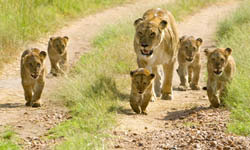 Masai Mara National Reserve is the Northern extension of the Serengeti National Reserve. With rolling grass fields, the scenic reserve is home to the big five and with over 500 species of bird life species having been recorded it’s also a bird watchers haven. After lunch, you will embark on an afternoon game drive at this majestic and scenic reserve. Overnight at Sentrim Mara Camp. Enjoy an early morning game drive in this part of the Northern Serengeti Ecosystem is where the great wildebeest migration takes place. Months before the actual migration the herds ‘assemble’ in Serengeti in readiness for the crossing into Masai Mara. The plain is literally covered with these animals. Grunts and other animal sounds are heard, and territorial fights are commonplace. The migration, now declared the Seventh-wonder of the world takes place from end June to beginning October. Overnight at Sentrim Mara Camp. After breakfast at your camp, drive back to Nairobi arriving in time for lunch (lunch will be at own). Afterwards, you will be transferred to Jomo Kenyatta international Airport to arrive in time for your outbound international flight. - Meet and greet service by our local representatives at JKIA Airport. - Tips and gratuities to driver/guide; hotel/camp and restaurant staff; room service etc. - Items of a personal nature i.e. telephone/internet usage, laundry, bottled water and other alcoholic and non-alcoholic beverages, etc.